Biscuits with gravy on a “diet”? Oh yes! When I was in college, I was nicknamed “Belle”, as in Southern Belle. Along with a set of pearls, I had my signature biscuit recipe, Belle’s biscuits! My friends would always ask me to make biscuits for them and any trip “home” to anyone’s house usually resulted in a couple of batches of biscuits along with teaching the friend’s mother how to make them. 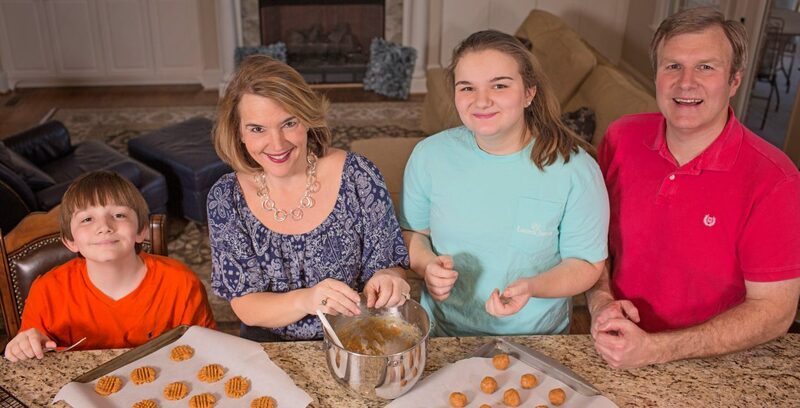 When we started eating low carb high fat, I feared my biscuit making days were over. As I discovered low carb, high fat biscuit recipes and learned more about baking with alternative flours, I began tweaking recipes. This recipe is the result of tweaking various recipes. In addition to using finely ground almond flour, I use oat fiber. Oat fiber has zero net carbs and gives low carb baked goods a more traditional flour-y mouth feel. It’s a wonderful addition to your low carb pantry! Caution: oat fiber is not the same as oat flour, so you cannot interchange them. Oat fiber behaves a bit more like coconut flour in that it is “thirsty” and requires more liquid ingredients. Use a hand mixer to beat egg whites until frothy but not stiff. Add in almond flour, oat fiber, baking soda, xanthan gum, salt, and erythritol and mix well with the hand mixer. Add in butter and use hand mixer until well blended. Add mozzarella cheese and stir thoroughly. Grease a muffin tin and fill each well 3/4 full. Bake at 400° for 10-12 minutes. Enjoy! Meal Planning: What’s For Dinner? Your recipe calls for cheese, but it’s not in the directions. When is that added? Also, do you provide any nutrition info for your recipes? Great catch! Thank you so much! I’ll add it now. I don’t like to provide nutritional information as it varies somewhat by the ingredients used. Also, some folks count total carbs and others net. For the biscuit recipe, the primary source of carbs is from the almond flour. Take the carbs from that and divide by 12 and you have a good idea of the carbs per serving. It looks like the mozzarella cheese is missing from the recipe instructions. Will you please amend? Thank you! Yes! Added now. Thank you! recipe calls for 10 eggs whites. how much would that be if I bought the egg whites and not crack the egg? would that be like 1 cup, 3/4 cup. I’m out of the egg white cartons right now, but I remember it being on the side of the carton. It’s close to a cup I think, but please use the guidance on the carton. If I purchase more soon, I post the equivalent. My carton (the little guy) says 3 TBSP is a serving and there were 10 servings in the carton so I dumped the whole thing in and the consistency of the dough seemed right. They are in the oven now. 🙂 Thanks, Kristi! Fantastic!! I hope they turn out great!!! That’s wonderful! I haven’t tried then as a drop biscuit but did use them as a biscuit topping for lc chicken pot pie. It was perfect! To use them as a drop biscuit, I’d refrigerate or even briefly freeze the dough before baking. You could also try it in a whoopie pan for a flatter, but more round shape. Let me know if you try it. Thank you! I’ll try that. I’ll let you know! What is the nutritional information for this? Especially the amount of carbs? Thanks! Hi Alisha! For the ingredients I use with the oat fiber and no coconut flour, there are 2.4 net carbs per 1/12th recipe. In addition, there are 19 g fat, and 9.4 g protein. Hope that helps! I made it with coconut flour and MFP said it was 212 Cal, 18.2 fat, 3 net carbs, and 9.4 protein. I’m not sure why the difference in fat, but the coconut flour did add a bit of carb. They were delicious! Thanks for checking it with coconut flour! So glad you enjoyed them. I had one this morning with sausage and cheese and didn’t think of food again until more than 5 hours later. It just makes good morning! Definitely baking powder!! I will edit that. So sorry for the confusion. Oh. My. Goodness! These are delicious. Light and fluffy. Made them tonight to serve along side home made chicken “noodle” soup. My husband loved them. We plan to have some tomorrow- what’s the best way to store them short term? I put them in a zip bag in the refrigerator. How do they hold up after a day or two? Thanks for all you do! Yay!! So glad that you liked them! They keep well in the fridge for three or four days. They freeze well too! Can this recipe be turned into a bread recipe? My whole family loves the flavor of these biscuits. I’ve made your version of Holy Grail bread and even though it is good, I believe this recipe would make better bread. What are your thoughts? l put mine in a loaf pan and it turned out perfect. 400 degree for about 40 mins. Next time l am going to make a sweet bread, add half batter then sprinkle sweetener and cinnamon mixture then add remaing batter.